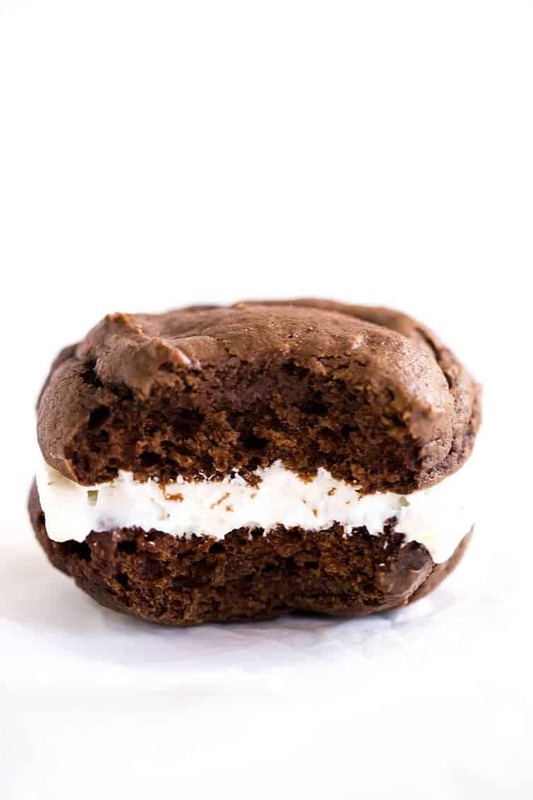 If you’re from western Pennsylvania, then what the rest of the world calls whoopie pies, you fondly refer to as GOBS. Two soft, cakey chocolate cookies sandwich a creamy frosting filling, and the combination is utterly addicting. Even if you think you’re not a fan of these types of cookies, this recipe will change your mind in a heartbeat! Gobs are to western Pennsylvania what whoopie pies are to most other regions. They are quite simply two chocolate cake-like cookies that sandwich a fluffy white filling. 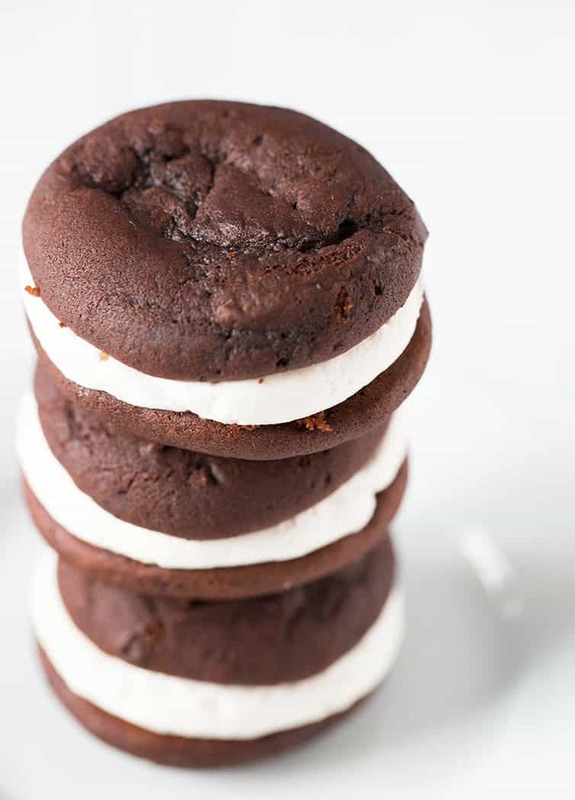 While whoopie pies come in many different flavors and variations, gobs are most assuredly always chocolate with a white creamy filling in the middle. I ate a lot more gobs when I was a kid than I tend to do now. My mom would sometimes get them as a treat from the grocery store, and at most birthday parties, someone’s mom inevitably showed up with a plate of gobs. 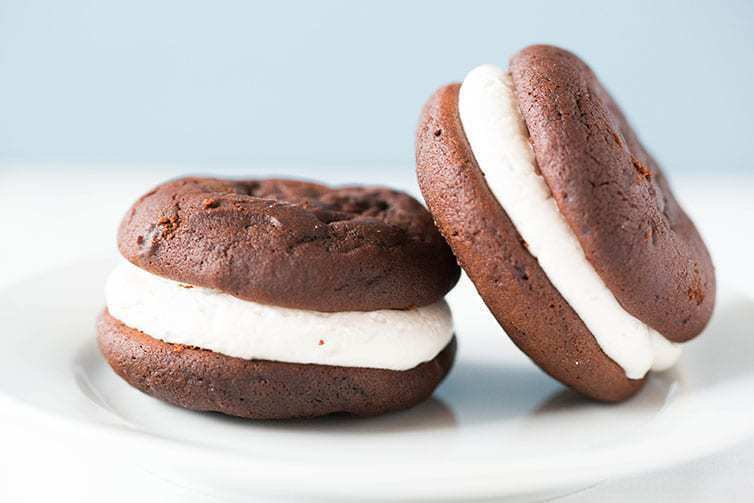 They were just one of those things that were always around as a kid, and now as an adult, I realized that I totally took them for granted, especially in the wake of the whoopie pie craze. My mom had given me a copy of her recipe, which she received from her friend Karen umpteen years ago, and here it is! I love how incredibly easy these are to make, not to mention how fast they bake! You can certainly make them larger or smaller if you’d like; I experimented with a few different sizes and found these to be perfect in terms of my personal preference. They’re large enough that you don’t feel like you need to eat more than one to get your fill, and not so big that you feel as though you totally gorged when you’re done eating one. The original recipe for the frosting used shortening, but I’ve since switched to using all butter – it tastes SO much better! While I still haven’t been able to nail down the origin of the name “gobs” (it’s bugging me! ), I’m so happy to have resurrected this recipe. They stirred up great memories, and reminded me that I need to make them more often! I sent a large plate of these into work with my mom, and she had more than one coworker tell her that these gobs were the best they’d ever tasted. I have no idea where my mom’s friend got the recipe, but it’s definitely a winner! A classic! Cakey chocolate cookies with a creamy frosting in the middle. Preheat oven to 450 degrees F. Line two baking sheets with parchment paper; set aside. Using an electric mixer, cream together the shortening and sugar on medium speed until light and fluffy, about 3 minutes. Add the egg, egg yolk and vanilla extract and beat for another 1 to 2 minutes, or until completely smooth and combined. Reduce the mixer speed to low, add one-third of the flour mixture and beat until just combined. Add the buttermilk and mix again, followed by another third of the flour mixture, the hot water, and then the remaining flour mixture. Give the batter a few quick folds with a rubber spatula to ensure all of the ingredients are incorporated. Drop the dough onto the parchment-lined baking sheets using a medium cookie scoop (about 1½ tablespoons of dough). Bake in the preheated oven for 5 to 6 minutes. The cookies should look puffed and completely set. Let cool on the baking sheets for about 5 minutes, then transfer to a wire rack to cool completely. Make the Filling: Cream together the marshmallow fluff and butter on medium speed until light and fluffy, about 3 minutes. Reduce the speed to low and add the powdered sugar, salt, and vanilla extract; mix until all of the sugar has been incorporated, then increase the speed to medium and beat for another 3 to 5 minutes, until the mixture is light and fluffy. 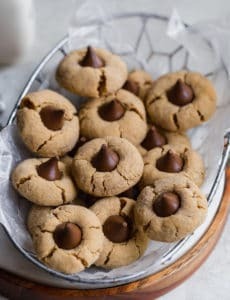 Assemble the Gobs: Using a pastry bag with round decorating tip, or a spoon, spread some of the filling onto the bottom side of half of the cookies. Top with the remaining cookies. The gobs can be stored at room temperature in an airtight container for up to 5 days. When this recipe was originally posted, there was a typo in the amount of water and buttermilk; the correct amounts are now reflected in the recipe. My apologies for the inconvenience. This recipe is easy doubled. You can make mini gobs by using a small cookie scoop (or about 2 teaspoons of dough). Reduce the baking time by 1 to 2 minutes. This recipe was originally published on February 25, 2013. I’m from western PA. Gobs may look like a Whoopie Pie but I can assure you, they do not taste the same. Whoppie Pies are much sweeter. The recipe here is NOT for gobs. Original gobs definitely would not have marshmalow fluff on the filling. I have my mom’s recipe, which has the partly cooked filling. I think the secret is the Crisco… I go to a fall festival in Bedford PA and many of the booths have gobs, from the original chocolate to pumpkin or oatmeal. The best ones are the ones with the original filling. I grew up in Western PA and lived gobs! We always had bake sales at school and had gobs as the main item! I never knew they had a different name until I went to college and no knew what I was talking about!! Our recipe for the filling was a cooked flour and milk paste and then you mixed granulated sugar and shortening to make that fluffy yet not too sweet filling! Soooo good. I need to make these more often as my family loves them as well. We live in IL now, but my kids eat gobs, not Whoopie pies! Cook milk over low heat. Make like a gravy on the stove, slowly adding flour stirring constantly until smooth and thick. Once this is cool, put in a bowl, cover, and refrigerate overnight. Blend flour mixture into this. Drop by tablespoon on greased cookie sheet (I use parchment paper) and bake 7-8 minutes in 350 degree oven. Blend very well. Put this filling onto the baked cakes and place together. Wrap in waxed paper individually. GOBS and woopie pies are not the same. My grandmother worked at a cookie factory thatmade GOBS in Johnstown PA when she was a teenager. She was able to get the recipe before that factory closed. I only read some of the comments about the filling, some of those are close. The flour and condensed milk get cooked to a soft dough consistency then chilled. After being chilled, the butter, powdered sugar, salt and vanilla are blended in. For the cake portion, we did make a change. Instead of sour milk, we use sour cream. Also grew up in western PA but left 40 years ago. I thought about gobs several years ago but couldn’t find a recipe online. I finally tracked down a recipe from a relative still up there. They were an enormous hit down here in the deep South as well! I also used the filling that you has to be cooked–somewhere in the back of my mind I think it might be called Waldorf-Astoria frosting or something. I absolutely love it but am definitely going to try the marshmallow creme filling! I always sprinkle the tops with powdered sugar. Just curious is the marshmallow better than the other filling that doesn’t call for it. Hi Janette, I think so, yes! They were beautiful, but the filling had way too much of a butter taste and I even added a half cup extra powdered sugar. Thanks for sharing. Maybe I will use less butter next time. I made these last night and was pleasantly surprised! The recipe is easy to follow. 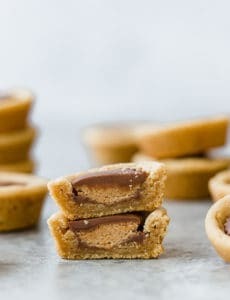 I would change the vanilla in the filling to maybe 1 teaspoon instead of a tablespoon, my filling is very vanilla-y lol. Also, I had no parchment paper, so I greased the pan. Not the best choice, as these bad boys like to travel on a greased pan!! Will be trying again! When we lived in Danville, PA, almost 35 years ago, our special neighbor gave us samples and her recipe for the Gobs. They were so delicious! I want to bake them for our Ladies Group at our church’s bake sale. I misplaced the recipe and remembered it had buttermilk, which this recipe has as one of the ingredients. Thank you! I am from the Chicago area and grew up with gobs. Every time I would mention them to people, they would look at me funny and say “never heard of them”! I thought it must be a German thing since it was my Grandma’s recipe and she was German! My grandmas filling recipe is different than this one. She made it in a double boiler with margarine, shortening, milk, flour, sugar and vanilla. Glad to see someone else has heard of them before!! They are a staple at our family picnic every year. I will be eating some tomorrow… yum! I just made these. I am also from the Pittsburgh area so I grew up with gobs. This was as I remembered them except the icing they suggested. To the other post, yes my mom made an icing she cooked. However, she has a new recipe that gives you the same icing that our moms made but you don’t have to cook it. I just wish the gob cookie was more moist but has a nice flavor. Try this icing, it tastes the same as the cooked.1/2 cup butter or margerine, 1/2 cup Crisco, 1/2 cup milk, 3/4 cup sugar, 6 Tab of flour, 1 teas vanilla, 1/2 teas salt. Put in bowl all together, with electric mixer start off slow until it is mixed then turn on high and beat for 5 min until icing consistency. Don’t worry, at first it will look like it is not going to get thick ……keep mixing on high. Gobs and whoopie pies are not the same things. 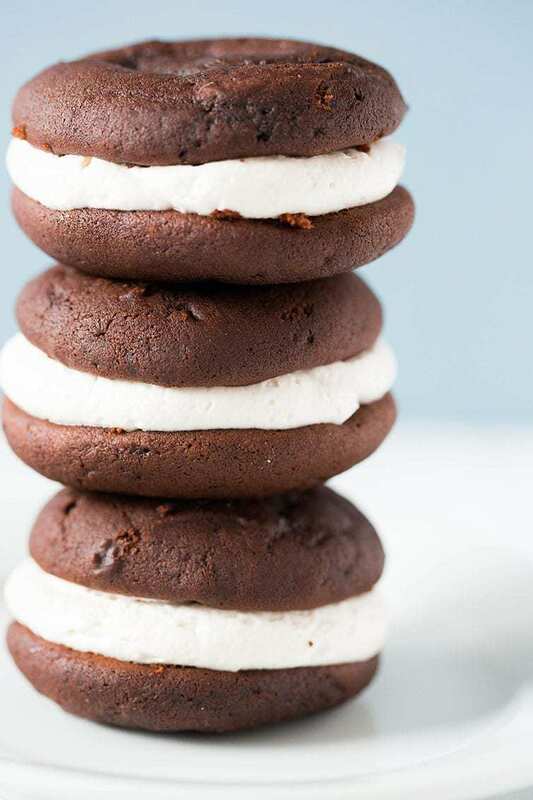 Whoopie Pies have marshmallow, gobs do not. The cake is also a little different. 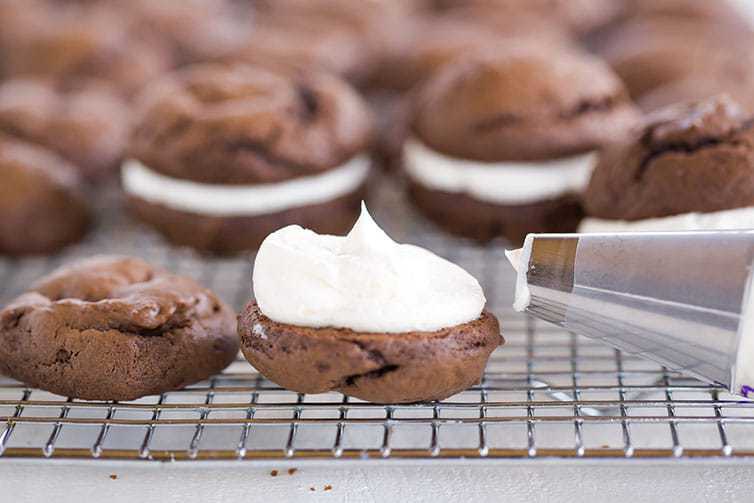 This recipe is for whoopie pies, not gobs. These little cakes were named GOBS after sailors in WW II. The story is that a mother wanted to send her son a chocolate cake while he was serving in the Pacific Theater of the war. She knew the cake would be a crumbled mess until her son got it. She decided to make little cake instead. She made them, and mailed them to her son. They were a hit. I’m from Altoona and I grew up eating Gobs, my mothers aunt made them all the time. 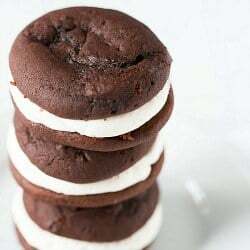 I’ve never heard the name whoopie pie until I moved to Fl. This recipe is similar to mine but a true Gob does not have marshmallow creme in the filling. I read that you substituted butter for the shortening in this recipe. However, this recipe, as far as the cake goes still has shortening listed as an ingredient. Is it in the cake where you made the substitution for in the filling? I may try them both ways and see what is liked best overall so I want to make sure I’m substituting it where should happen. thanks! Hi Pamela, I made the substitution in the filling; the cake is best made with shortening, as it helps the cookies not to spread too much. 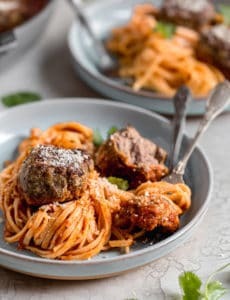 I made this recipe and they turned out delicious. I don’t have a two tablespoon scoop so instead I just used a heaping 1 1/2 tablespoon scoop. I had more than enough filling so I might cut that quantity back the next time and save ingredients. I used a dark chocolate powder because its what I had and they were nice and rich in flavor. Will make again. Thanks for the recipe. My dad is from Washington, PA –in Texas now, and has always talked about about chocolates gobs, and how his mom would wrap them up individually and freeze them! He hasn’t had one in many years, so I am totally gonna make these for him, and I’m so excited! i cannot believe i still haven’t made whoopie pies! oh well now i have to make these gobs this weekend to make up for it!